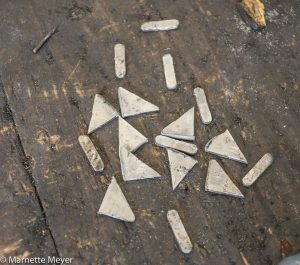 Melkbos.net – What a Load of Scrap! More than 48 motorists had flat tyres yesterday due to bits of scrap steel on the R27 between Melkbos and Atlantis. The affected vehicles included two police vans and the minibus belonging to the Melkbos Care Center which has been used this week to transport underprivileged children from Wolwerivier to Melkbosstrand High School. The scrap steel caused havoc in people’s lives. One woman reported on social media that her Land Rover had four flats; another man said that as a consequence of his flat tyre his children missed their aeroplane flight and that he was looking for compensation. Piet Thompson with one of the steel bits. A flat tyre also meant a whole lot of trouble for the Melkbos Care Center. It meant that the minibus was temporarily out of action since its jack had apparently been stolen and a substitute vehicle had to be found to transport the children from Wolwerivier to Melkbosstrand. This task fell onto the shoulders of photographer Marnette Meyer and the head of the Melkbosstrand Community Centre, Karen Dreyer. The latter has bronchitis, but had to work the phone and the day started late. Another woman reported on social media that her tyres were damaged and that this was a double blow as she was travelling back home after an operation. Who is to blame? 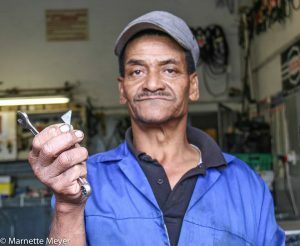 Earlier today Mechanic Piet Thompson from the Caltex garage in Melkbos concurred with most other people in saying that the culprit was probably a lorry carrying a load of scrap steel. He has a small collection on show in the garage, which he has been removing from affected vehicles. In the meantime the truck that caused so many people to have a scrappy Thursday and Friday has apparently been identified.